Before and after at Bond Lane, Mountsorrel: the cutting gradient has been altered, the platform has been constructed and the final track-laying is underway. Prior to the opening of the railway, a station platform was deemed necessary at Bond Lane, Mountsorrel in order that the track did not terminate ‘in the middle of nowhere’. This has now been completed. A turning area for tractor-trailer rides from the nearby Stonehurst Farm and Motor Museum was included in the plan, in order to coordinate with another significant local tourist attraction. 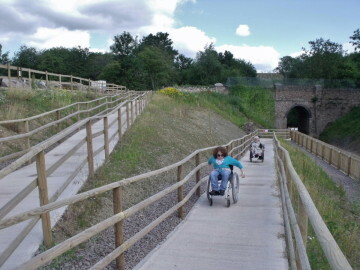 Limited car parking, mainly for disabled visitors, is also being provided and, despite the inherent access difficulties from the proposed platform being located in a cutting, it is wheelchair accessible. The creation of Mountsorrel Station was the final obstruction to the completion of track-laying on the Mountsorrel Railway. Track-laying had previously terminated 80 metres short of the proposed platform in order to make access and progress easier for the contractor, the volunteers and the necessary plant and equipment. The main contractor, Costock Building Services, commenced work during the first week of September 2014. As a result, a 58 metre long platform, including ramps at either end, has now been created. The platform has been designed for a train consisting of two coaches and a steam loco or a two coach diesel rail car. The contractor constructed the platform base and surface, after which volunteers erected a traditional picket fence at the rear of the platform together with the station name board. Happily, by the end of February 2015 the platform, the final track-laying, the buffers and sand drag were all complete. The track-bed was fully ballasted and, to achieve this, we maximised the help of Nigel (our key Lafarge contact with access to a JCB!) before he retired on the 14th February. It was certainly a herculean effort from all the volunteers who came to help. Every minute of time was critical if the ballast work was to be finished quickly. Volunteers even rotated two at a time, when breaks were needed, so that things could keep moving. By the end of that weekend there were lots of tired muscles but the job was done. It may have been tiring but the atmosphere was electric. The volunteers had moved 110 tonnes of stone over that weekend. To put this into context it is roughly the same as had been moved previously when volunteers spent six months fettling the ballast along the rest of the branch line. In other words, being able to utilise Nigel’s help effectively saved us 6 months of work! The track under Bond Lane bridge, just beyond the platform end, was also lifted and packed to the correct height. The location of a new platform in the base of the cutting has made the build quite complex. New gullies have been dug by hand and original field drains have been repaired and improved. Volunteers have undertaken extensive work to improve the drainage above the new platform and the cutting sides have been given a final profile, which has involved a lot of work with spades and barrows. Volunteers have also planted trees and seeded the car park perimeters and the cutting banks with a wild flower mix, which should ensure plenty of colour by the opening date! The new station platform and associated car park and the ramped access between the two, cost slightly in excess of £73,000 to construct. The lion’s share of this sum was provided by a grant from Lafarge-Tarmac’s Landfill Communities Fund. The much smaller sum that the Mountsorrel Railway had to provide came from a grant by the Edith Murphy Foundation and a Community award administered by Leicestershire County Council. We wish to record our thanks to all these funding bodies and to our magnificent volunteers for making the construction of this station possible.